Add a professional edge to your studio with the M-Track Eight from M-Audio. This 8-input USB audio interface enables you to track large music ensembles, record the band, or mic an entire drum set with pro-grade audio components and a myriad of connections. Eight combo XLR+1/4″ inputs accommodate nearly any source, from phantom-powered microphones to your favorite guitar, and eight dedicated outputs offer versatile playback options. The XLR inputs are designed to work with microphones and other Lo-Z sources, and the phantom power switch enables you to use condenser microphones by delivering 48v phantom power to the XLR inputs (Channels 1-4; 5-8). 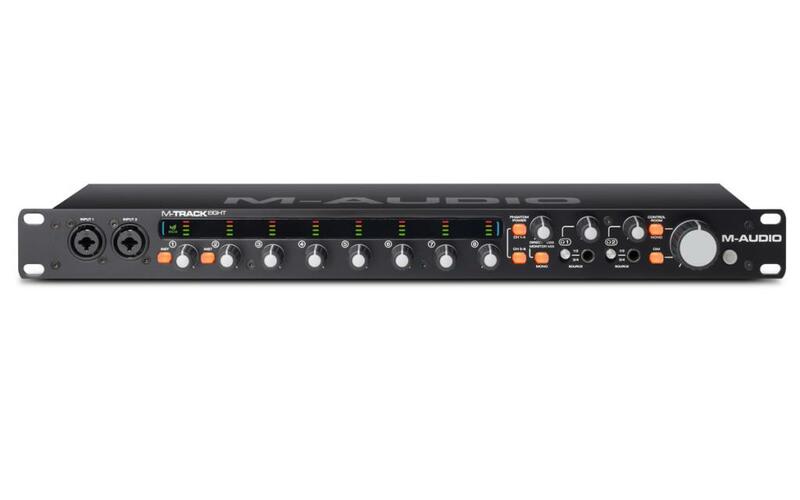 M-Track Eight also has two conveniently located inputs on the front panel that can be switched to allow instrument- level signals, so you can plug your electric guitar or bass directly into M-Track Eight and start recording. Individual gain knobs with meters help ensure the proper input level by providing real-time visual feedback.